Last month I asked a lot of questions regarding how we think about church. You can read the full blog here. I continue to process these questions. I’m seeking God’s guidance in all of it. Here’s where my thoughts are currently. Right now I am praying daily for God to give me opportunities to share Jesus with people who do not know him. God is always at work drawing people to himself through the work of the Holy Spirit. I want to look intentionally for those whom God is drawing into a personal relationship with himself. I want God to use me to reach them. I am also praying daily for God to give me opportunities to disciple those who already know him. I am intentionally looking for those one-on-one opportunities to help others grow in their relationship with God. The key word in both scenarios is “intentionally.” This idea is new to me, and it fills me with a sense of anticipation as I begin my day in this way. I am learning to slow down and readjust my schedule to take time for others. My laptop is not working well. At times, the processor will grind to a halt. Sometimes it shuts down unexpectedly. It is frustrating. One day a particular program I was using was conflicting with my calendar program. I called the Customer Care line and learned they were aware of the conflict and were working on a fix. I was on the phone with the agent for over an hour while we tried to fix the issue. During a slow reboot, we had time to talk. I learned the agent had been a youth pastor. I asked him to tell me about his relationship with God. He shared with me the various ways he was serving in his home church. I listened for a few minutes. Then I said to him, “So far you have told me what you are doing for God, but you still have not told me about your relationship with him.” There was a pause on the line. After a moment he replied, “That is very insightful.” As we continued to share, it occurred to me that this was a moment I had prayed for that morning. This moment was an opportunity to disciple someone, even though I did not personally know him. I shared with him about learning that ministry can become an idol. I shared my own story with him about learning to enjoy sitting on God’s lap and focusing on my relationship with him instead of the pressures of ministry. Because that morning I had prayed for the opportunity, I was aware of the moment when God showed up. It occurred to me that when I pray this way, by default I give God full control of my calendar. If he wants to cause my laptop to fail so I will spend time with someone on a tech call, he has the right. Surprisingly, it gave purpose to what I would generally consider a delay. I had plenty of items on my to-do list for the day. God cleared all of them away so he could use me to minister to someone else. When we live with intention, it gives purpose to the mundane moments. What would happen if daily we intentionally looked for opportunities to share Jesus with those who do not know him? 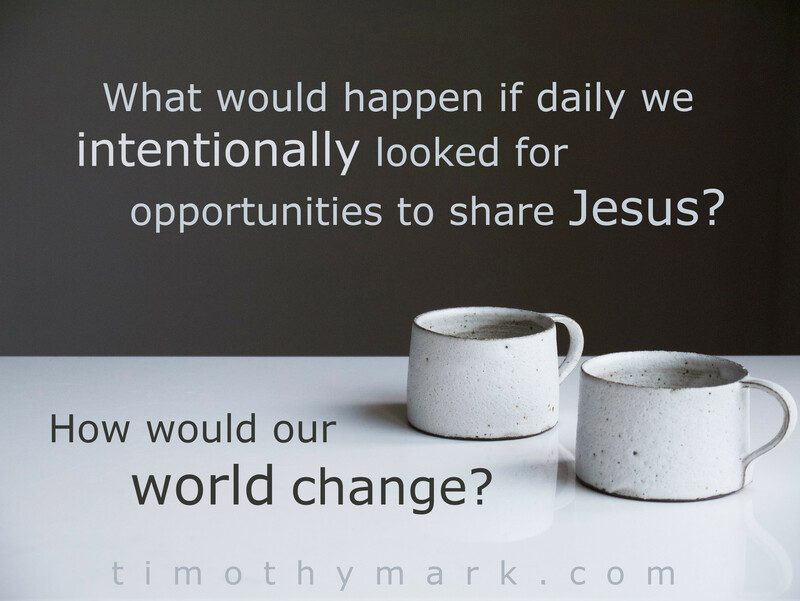 What would happen if daily we intentionally looked for opportunities to disciple other followers of Jesus? Would our lives look different? Would it affect our schedules? What would happen if we made it our intentional daily goal to love God with abandon and selflessly love others? Would we give away our resources to meet the needs of others? Would we use our resources to minister to the poor in our communities? How would our world change? I ask these questions because it seems like these are elements missing in many churches today. We seem comfortable to attend church, sit when it is time to sit, stand when it is time to stand, sing when it is time to sing, listen to someone teach, and then return home and live lives that are pretty much the same as the lives of anyone else in our neighborhood. There is an uneasy disconnect between what we do on Sunday and how we live Monday through Saturday. This disconnect is why I repeatedly call for an authentic relationship with God. If our relationship with God does not affect our lives and the lives of those around us, then maybe we should question if we are actually in a relationship with him. In the end, I want to follow Jesus intentionally. I’m not content to hope it will happen by osmosis. I want to live a life of abandon, willing to give all to see others come into a personal relationship with God. I want to do whatever it takes to see others grow in that relationship. I want to share my faith intentionally. I want to disciple others intentionally. I want to grow in my relationship with God, intentionally loving him with abandon and selflessly loving others. Will you join me? Will you live a life of intention? What would God do through you if daily you asked him to give you opportunities for sharing Jesus and discipling others? It just might change your life and your world. I always enjoy reading your comments. Feel free to post your thoughts below. © 1988 - Present Timothy Mark Ministries, Inc. - All rights reserved.